It’s important for me, as a writer, to read a lot. I read books by the world’s best authors so I can pick up new techniques for my craft, and to make sure people like Stephenie Meyer aren’t plagiarizing me. Mostly, though, I read because I need to keep track of my competition and stay up to date on market trends. Recently, my empirical research has shown that, if I want to obtain unimaginable wealth, I should be writing a bestselling book about wizards, or vampires, or wizards who are also vampires. This is a cause for concern, considering my strategy the last few years has been to write a free blog about nothing in particular. But what can I say? I can only listen to my inner muse, and my inner muse happens to be lazy. 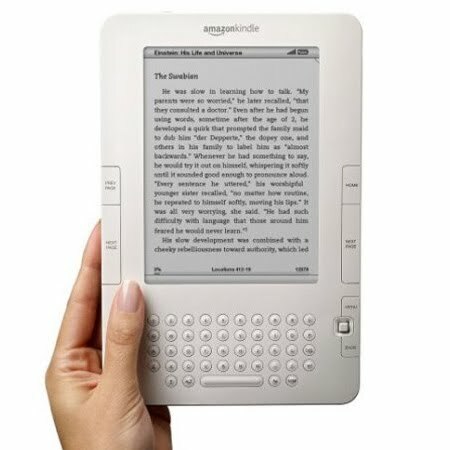 I’ve been encouraged by a lot of people lately to make the switch to an eReader, the lovechild of my two favorite things, books and technology. I’ve put a lot of thought into the matter, but I just can’t bring myself to abandon old-fashioned books in favor of a Kindle or an iPad. I must admit, there are times when I’m tempted to buy an eReader. I’m attracted to its slender size, which makes it far more portable than some books. I’m currently reading Mark Twain’s autobiography, which is exactly a bajllion pages long. The meteor that killed the dinosaurs was smaller than this titanic hardcover. This causes a serious problem when travelling, because in order to cram the cement block into my suitcase, I usually have to jettison one of my sneakers. Do I want my trip marked by wit or level footing? I’ll usually choose the shoe over the book, which explains why I’ve read the latest edition of SkyMall 29 times. So yes, thick books can be annoying for travel, but eReaders have their own problems. Take the iPad, which has an iBooks application among its myriad other iFeatures. I have one, but I can’t read books on it. There are just too many distractions on the iPad, and it’s hard to make progress on a book when I constantly receive notifications that Grammie has emailed me another YouTube video. Sorry, Mr. Salinger, Holden Caulfield may be a compelling character, but he ain’t no kitten getting stuck in a pickle jar. The iPad also has problems with glare, and the reflection on the screen can be really irritating while reading. I don’t know about you, but I prefer not to look myself in the eye as I read Snooki’s book. Call it pretentious if you will, but I like filling my shelves with the books I’ve read. It’s kind of like a hunter putting stuffed animal heads up on his wall. Sure, books don’t put up as much of a fight as a moose, and sure, most of my conquests take place on the toilet instead of the wilderness, but still I’m proud of each book I’ve completed. I want you to walk into my apartment and notice the amount of books I’ve vanquished, and not the smell. I want you to marvel at how culturally refined I am, and wonder how I possibly had the time to read all 22 volumes of the Peanuts Anthology.